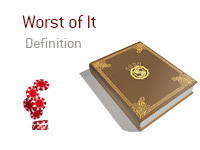 What does the term "worst of it" mean in poker? What is the definition of the term "worst of it"? In poker, having the "worst of it" means that you are in a situation where the odds of winning the hand are against you. For instance - let's say that you are playing in a $1/$2 No Limit Hold'em game at your local casino. Let's say that you get involved in a big pot with one other player. After a flop of Ah-Kh-2c, you and your opponent get all-in. You are holding 7h-8h for a flush draw, while your opponent flips over Kc-Kd for middle set (set of Kings). In this case, you got your money in with the "worst of it", meaning that you are a statistical underdog to win the hand. It ends up being your lucky night, however, as the river brings the 6h, giving you a flush and the monster pot.